My idea of the perfect weekend breakfast is a stack of Pancakes with butter and maple syrup dripping down its sides. I love how Pancakes use the most basic of ingredients. Just flour, sugar, salt, baking powder, an egg, a little butter, and milk. Like a muffin batter, just two bowls are needed. One for the dry ingredients, and one for the wet ingredients. Then the two are simply stirred together and the pancake batter is ready to be ladled onto a hot skillet. Pancakes can be made in any size and shape, ranging from the size of a silver dollar to a round as large as your pan. You will know it is time to turn your pancake when the top surface begins to form small craters. Continue to cook the pancake until both sides have turned golden brown and it is cooked all the way through. Some say you should only flip a pancake once, but that is an old wives' tales. If you are not serving the pancakes immediately, place them in a warm oven (175 degrees F (80 degrees C)) directly on the wire rack. I do not like to stack the pancakes until serving as this will make them soggy, which will never do. While butter and maple syrup are the proverbial favorite, pancakes are also good with jam, fresh berries and whipped cream, or with just a dusting of icing sugar. What is interesting about a pancake batter is that by changing the proportions of dry to wet ingredients you can change the thickness of the batter. Pancakes are known around the world by different names. If we make a thin pancake batter they are known in different countries as French crepes, blintz, Chinese pancakes (Bao bing) and a Hungarian palacsinta. 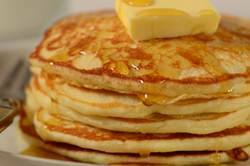 A thicker batter makes an American pancake (also known as griddle cakes or flapjacks (meaning "to flip")), an Australian pikelet, a Scotch pancake or a drop scone. Both types of batters produce a pancake that is light and fluffy with a soft crust and spongy texture. Although pancakes are mainly served for breakfast they take center stage on Pancake Day, or Shrove Tuesday (Mardi Gras), when they are served for supper. The ingredients used to make pancakes (flour, sugar, butter, milk and eggs) are forbidden during Lent so this is considered a 'feast' before a 'fast'. It is interesting to note that the word 'Shrove' comes from the word 'shrive' which is the Tuesday before Lent and the day on which parishioners shrive, or confess, their sins. Albala, Ken. Pancake. A Global History. Reaktion Books. London: 2008.